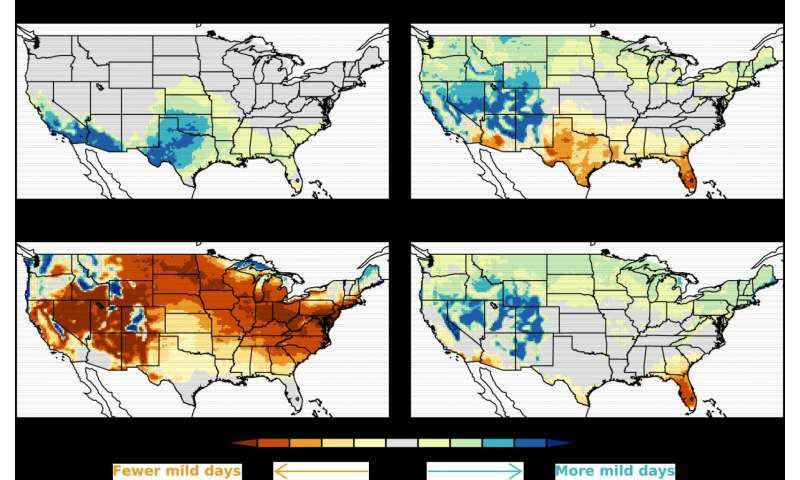 As scientists work to predict how climate change may affect hurricanes, droughts, floods, blizzards and other severe weather, there's one area that's been overlooked: mild weather. But no more. NOAA and Princeton University scientists have produced the first global analysis of how climate change may affect the frequency and location of mild weather - days that are perfect for an outdoor wedding, baseball, fishing, boating, hiking or a picnic. Scientists defined "mild" weather as temperatures between 64 and 86 degrees F, with less than a half inch of rain and dew points below 68 degrees F, indicative of low humidity. Knowing the general pattern for mild weather over the next decades is also economically valuable to a wide range of businesses and industries. Travel, tourism, construction, transportation, agriculture, and outdoor recreation all benefit from factoring weather patterns into their plans. The new research, published in the journal Climatic Change, projects that globally the number of mild days will decrease by 10 or 13 percent by the end of the century because of climate warming from the buildup of human-caused greenhouse gases in the atmosphere. The current global average of 74 mild days a year will drop by four days by 2035 and 10 days by 2081 to 2100. But this global average decrease masks more dramatic decreases in store for some areas and increases in mild days in other regions. "Extreme weather is difficult to relate to because it may happen only once in your lifetime," said first author Karin van der Wiel, a Princeton postdoctoral researcher at NOAA's Geophysical Fluid Dynamics Laboratory (GFDL) located on the university's Forrestal Campus. "We took a different approach here and studied a positive meteorological concept, weather that occurs regularly, and that's easier to relate to." Scientists predict the largest decreases in mild weather will happen in tropical regions because of rising heat and humidity. The hardest-hit areas are expected to be in Africa, Asia and Latin America, where some regions could see 15 to 50 fewer days of mild weather a year by the end of the century. These are also areas where NOAA and partner research shows economic damages due to climate change. The loss of mild weather days, especially during summer, when they can serve to break up extended heatwaves, also could significantly affect public health. People living in the mid-latitudes, which include much of the United States, as well as many mountainous areas around the world, will gain mild weather days on average, the new study found. The biggest winners will include communities along the border with Canada in the Northeast, Midwest and Northwest, as well as many parts of Canada. 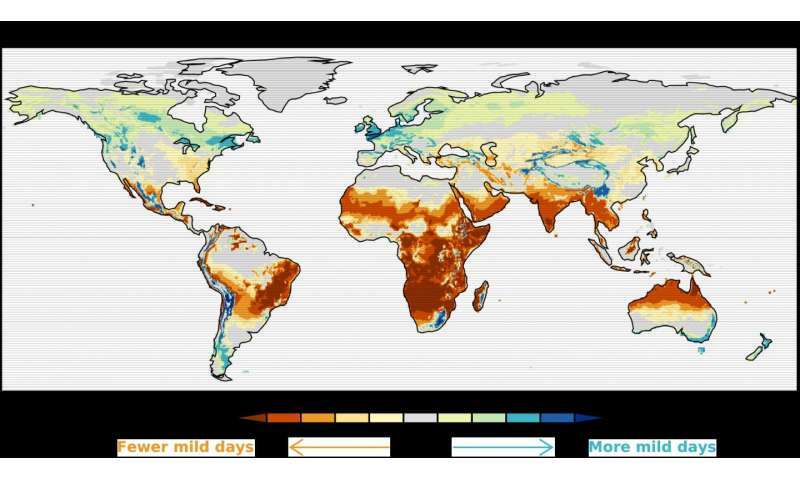 Other areas projected to gain as much as 10 to 15 days more annually of mild weather by the end of the 21st century include parts of England and northern Europe, and Patagonia in extreme southern South America. In some of these areas, mild weather will drop during increasingly hot and humid summers but become more plentiful in fall, winter and spring as winters warm and the shoulder seasons last longer. "We believe improving the public understanding of how climate change will affect something as important as mild weather is an area ripe for more research and more focused studies," said Sarah Kapnick, a physical scientist at NOAA's GFDL and co-author. "Predicting changes in mild weather is not only important to business and industry, but can also contribute to research on the future of physical and mental health, leisure and urban planning." Scientists used high-resolution climate models to investigate the changing patterns of mild weather globally by examining the effect over time of increased warming from the buildup of greenhouse gas emissions in the atmosphere. The work was made possible by decades of Earth system and model development at NOAA's GFDL and by improvements made to NOAA's research supercomputing capability, including access to two high performance supercomputers, Gaea and Theia, named after figures in Greek mythology. How goes that "after Katrina we will face more and more devastating hurricanes!" ? Didn't happen of course, because long-term climate or weather predictions are impossible. That is a stupid statement; you deliberately choose the most recent notable exceptionally devastating hurricane (Katrina in this case) in the last exceptionally bad year (of 2005 in this case) for hurricanes. You could always deliberately choose whichever is the most recent and devastating hurricane in the last exceptionally bad year for hurricanes and idiotically say there hasn't been an increase in frequency of such hurricanes since then; But that must always be true REGARDLESS of any actual long term trend in any change to the frequency of such hurricanes. Thus, obviously, that is not evidence against the prediction that the long term trend is for greater frequency of such hurricanes so your point is idiotic and mute. Using the same flawed 'logic'; it is spring and there hasn't been a warmer day since the last warmest day; so the weather will not get warmer? That is a stupid statement; you deliberately choose the most recent notable exceptionally devastating hurricane (Katrina in this case) in the last exceptionally bad year (of 2005 in this case) for hurricanes. The new and "improved" GloBull warming, now with 100% more bull. No Humy is spot on, your comment is ridiculous yet again, it has been proven countless of times that human's add unnatural warming to the earth's climate due to fossil fuel burning, your dumb comment as an antigoracle sock yet again proves your inability to understand science. long-term climate or weather predictions are impossible. Butterfly effect is relevant to long term weather. Not to long term climate. Climate is a function of global energy content (which can be calculated/estimated). Weather is a function of short-term, local conditions (which cannot be calculated/estimated to a great degree of certainty for long timespans in the future). Climate. Weather. Learn the difference. Were you born this stupid or have you been practicing. Tell us what is the forecast for where you live, 2 months from today? Tell us, how long have you lived where you are and how globull warming has changed the climate there? Will continue changing for only hundreds more years? What's he know that he's not telling us? I've just always thought the planet has at least a couple billion more years to go. A propaganda piece, devoid of facts, is comprehensive. Hmmm, 13 years ago a drought resulted in the shutdown of nuclear reactors. So, what happened since then, did CO2 decrease? Here is a fact for you, in Germany, temperatures rose as fast and were as hot, if not hotter, during the 1930s. he only cite's that which is hot and that which we call air, it's his proven self inflicting formula for the past 2 decades now, the world finding it hilarious continulally behing whipped by the ringmaster in the circus as he desperately jumps up and down for bananas.